Over the years of painting I have learned that I need a defined mission in mind before I start a new painting, especially a large one. Ideas come to me as I travel and visit certain sights. 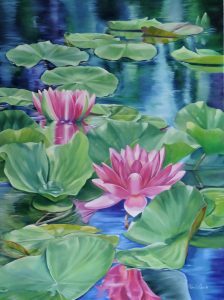 “The Water Garden” (36” x 48”) idea was discovered as I was visiting Longwood Gardens in Pennsylvania. Combining different parts from my photos I form my composition. I decided to explore the use of vivid oil colors especially the phthalo colors such as Gamblin’s Phthalo Emerald, Phthalo blue. Transparent colors were also involved in keeping with the idea of vivid colors; Gamblin’s Quinacridone Red, Quinacridone Magenta, Hansa Yellow Lite, Hansa Yellow Medium, Hansa Yellow deep, Indian Yellow, and Dioxazine Purple. I first tone the canvas with a variety of transparent colors: Manganese Blue, Phthalo Emerald Green, Phthalo Blue using Gamblin’s Neo Megilp for faster drying time. I stay with the Gamblin’s Neo Megilp through the whole painting process. After a few days of drying I start to sketch in the individual shapes forming the compositions. Then the process begins by using the transparent colors I map everything in place. By the time I get to the last part of the painting, at the top, the bottom is dry enough to start working on more defined painting. This process: painting bottom to top of the large painting is done several more times. I always add another layer of paint on a mostly dry surface. At the end of the painting I go back and glaze areas that I feel need to stand out. The process of painting always presents problems to be solved with each painting. I was having a problem getting my water lilies to be more vivid; the red seemed to be a little dull. After searching and studying other artist’s work I discovered that glazing some transparent orange (hansa yellow deep + quinacrodone red) in areas of the red lily could be the answer and it worked.